And we have a new winner! As is usual, on the first auction for the new year at the Tsukiji fish market, a new record was set for the most expensive tuna sold. 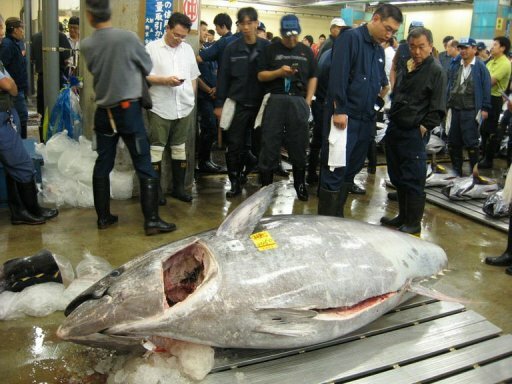 Selling for $736,000 (56.49 million Yen), the 593 pound (269 kilogram) bluefin tuna came out around $1,238 per pound. That price likely does not reflect real market prices, which are still quite high, but more the celebratory feeling that permeates the Tsukiji fish market on the first auction day of the year. Every year, a new record seems to be set for the bluefin tuna, which should come as no surprise as these fish are becoming more and more scarce every year. While the fish has already been prepared and sold as nigiri sushi and sashimi for under cost (no doubt as 1 piece would normally have have retailed for $96 per, if you do the math on the size of the fish), there will be more to come. But doubtfully not at the same incredible price. Atlantic and Pacific Bluefin tuna are primarily eaten in japan (which purchases about 80% of the global catch of these species). They face growing calls to reduce their catches due to the incredible decline in the number of bluefin tuna in the oceans over the past 25 years. Probably every year for a few more I will be able to make a post like this, but there will come a time, when the fish are commercially extinct, when I won’t. And that will be a sad day. It will indeed become a sad day when we can no longer acquire Maguro! I quite agree. It is a wonderful fish and I hope we can learn to fish responsibly before this magnificent creature is forever gone.